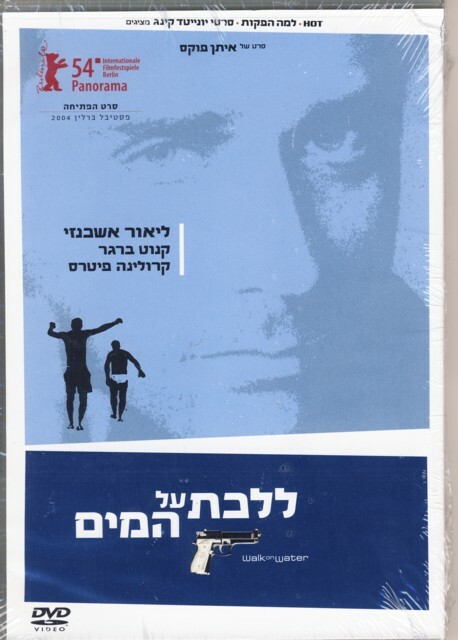 Walk on Water (2004) [Hebrew title: Lalehket al HaMayim] is an Israeli film by director Eytan Fox, set in the midst of the Second Intifada, in 2002. A crack Mossad hitman, Eyal, (Lior Ashkenazi) returns from a successful hit against a Hamas operative to find that his wife has committed suicide. His handler, Menachem (Gideon Shemer) believes that he is more upset than he claims to be, and gives him an “easier” assignment, hunting down an aging Nazi by pretending to be a tour guide for his young grandson, Axel (Knut Berger). Supposedly the old man is dead, but Menachem has come to believe that he was smuggled away from justice after the war, and he is still alive. Eyal becomes more involved than he intends with the young man and with his sister, Pia, who has been living for years on a kibbutz in the Israeli countryside. Before all is said and done, the film wrangles with the aftermath of the Holocaust, its connections to current events in Israel, Israeli-Palestinian relations, terrorism, and homophobia. It is a tall order, and a complicated film. To Fox’s credit, it is mostly successful in its attempt to tackle such challenging material: it was nominated not only for nine awards in 2004 by the Israeli Film Academy, winning three, but also nominated in 2006 for the much-coveted Cesar Award (France) for Best Foreign Film. Much has been written about the connections between the trauma of the Holocaust and the present-day responses of Israelis to security threats. This film focuses on these tensions within one man, who has a fierce love of his own country and yet who is growing sick of killing. It is also a testament to the power of relationship to transform lives. The film also does an excellent job of capturing the feeling in Israel during the Second Intifada. It was a very strange mixture of normal life going forward, regularly punctuated by horrific bombings. 1. Why does Menachem send Eyal after the old Nazi? 2. What do you think of the ethics of Eyal pretending to be a tour guide to get close to Pia and Axel to find out about their grandfather? 3. Should the Nazi have had a trial, or is it just simply to assassinate him? Should Eyal have followed orders? What do you think about Axel’s action? 4. In the opening of the film, Eyal kills without a second thought, after smiling at the child of the man he is about to kill. In Berlin, he twice has the opportunity to kill and does not. What happened to change him? 5. What did you think about Eyal’s attitude and behavior in the incident of the coat? Why did he behave as he did? Was he wrong or right? Why? 6. What changes Eyal’s attitude about Axel’s homosexuality? 7. At the end of the film, is Eyal still working for Mossad? Why do you think so, or why not? This entry was posted in Israel and tagged Anti-Semitism, Arab, Drama, LGBTQ, Suspense. Bookmark the permalink.